Effective management of invoicing, credit terms, cash receipts and other accounts receivable tasks accelerates your cash flow and keeps your company financially strong. VAI automates invoicing and collections processes to give you fast, efficient accounts receivable management. This automation can accelerate the cash cycle improve your business performance and customer satisfaction. Staying in constant contact with your customers allows you to better manage your accounts receivables, control credit and detect any potential issues. 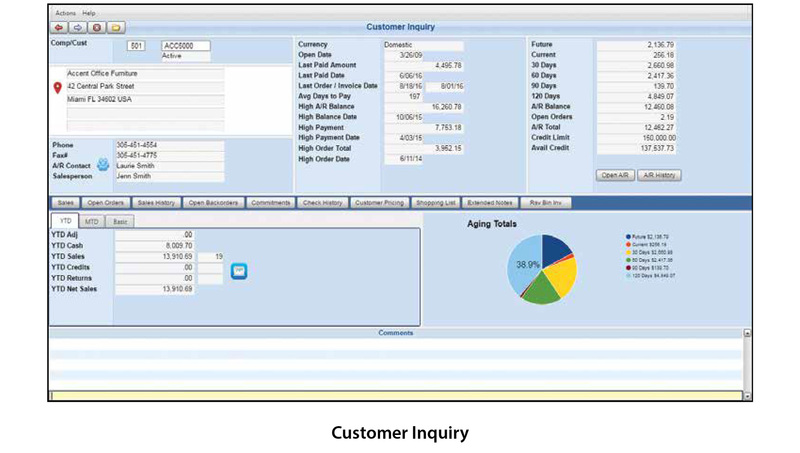 With the S2K Accounts Receivable Manager Screen, credit managers get a complete picture of customer aging, held orders and all collection activities. From one comprehensive screen, users can drill down to detailed invoice and payment information, extended notes, customer statistics, scorecards and dashboards. With our automated workflow, users are instantly notified of collection and transaction issues as they happen. The general ledger is an important tool for keeping your accounts organized and providing proof of your expenditures. It can be used to correct errors in accounts, observe company activity, and can help you make wise financial decisions to better guarantee your company’s future. S2K General Ledger is the center of our accounting system software. It provides powerful divisional and departmental accounting functions, maintains your journal, logs recurring entries, generates audit trails, and allows you to create custom financial statements. S2K General Ledger allows you to define the structure of your accounts and sub-accounts, and combines data from multiple entities and different currencies for consolidated reporting and analysis. S2K General Ledger also provides a bank reconciliation option that allows you to reconcile bank statements and general ledger accounts. You can track an unlimited number of bank accounts, void checks before they are sent or after they are posted, and review total debits posted to General Ledger for each period. With S2K Fixed Assets, it’s easy and cost effective to manage the complete fixed assets life cycle. The software helps to eliminate redundant data entry, increase accuracy, and reduce costs. It enables accounting professionals to gain a solid foundation for all fixed assets and depreciation management. Processes are automated, management is streamlined, and reporting delivers the insight you need to make informed management decisions. With comprehensive depreciation calculations for financial reporting, companies can effectively manage every step of the fixed asset life cycle, from acquisition to disposal. S2K Enterprise Accounts Payable software allows you to maintain and control every aspect of the management of your expenditures. It turns the tedious and time-consuming management expenditure process into a manageable piece of your corporate puzzle. Maintain complete vendor information including unlimited contacts, e-mail addresses, remittance address, purchase order addresses, and detailed notes. Define General Ledger accounts and pre-set distribution percentages per vendor for automatic allocations. Provide powerful inquiries that offer instant access to information including vendor invoices, debit memos, credit memos and payments. Enable you to view or print detailed purchase journals as well as open accruals on demand. Automate payment processing with check printing, one-up check printing, letters of credit, wire transfers, and ACH processing. Set automatic tolerance levels to flag buyers, through work flow alerts and conditional e-mails, if invoice discrepancies exist. Include flexible payment processing options such as automatic and manual payment selections, hand written check processing, letters of credit, and wire transfers. Provide bank reconciliation with the ability to clear checks and print reports that show cleared or outstanding checks. Interface S2K Accounts Payable with the paperless accounts payable solution from MetaViewer, which lets you automate your approval workflow.